The Program breaks knuckleball development down into easy-to-understand skills. You master each skill at your own pace. The Program’s booklet breaks down each skill in-detail. The accompanying DVD explains each skill and presents drills that you can use to master the skill. When you feel confident in your mastery of the skill, it’s time to move onto the next challenging skill. And so on until you graduate with all the skills necessary to throw a pro-quality knuckleball. The Program moves at your pace. Take as much time as you need to master each skill before moving on. This makes The Program perfect for any age, arm strength or baseball skill level. You can choose to commit to the training in order to develop rapidly to achieve a college scholarship or pro baseball contract, or you can master each skill on the weekends to develop a better delivery over the course of an entire off-season. In fact, many of these skills can be mastered indoors without a mound or ball. The Program eliminates the guesswork and the dead ends that most encounter with the knuckleball. Put together, these skills are guaranteed to develop your best pitch. The Program comes in Phase I, II and III. The first two phases take a full-body approach to mechanics. You’ll master each part of the delivery from the ground, up. You’ll be astounded how an adjustment made to your footwork will affect the release of the knuckleball. After completing Phases I and II, you’ll have a deep understanding of the mechanical approach to the pitch. Phase III is special. It is reserved for the serious knuckleball pitcher. The skills become more abstract but they are the skills that the pros use to throw violently moving knuckleballs. 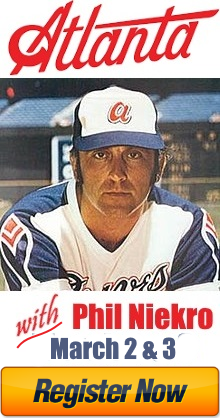 The skills in Phase III come from the pros such as RA Dickey, Phil Niekro and Charlie Hough. You’ll need Phase III’s skills to make it in high-level baseball. The founder of Knuckleball Nation, Chris Nowlin, was a certified personal trainer. Each phase of The Program comes with pro-level workouts that are designed to further enhance your knuckleball skills. The workouts progressively get more difficult and specialized as you move on in the program. You can get into pitcher-specific shape while mastering the knuckleball. There’s no wasted time. 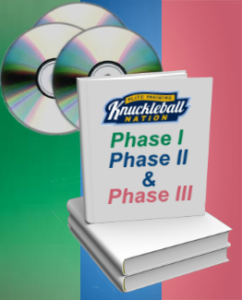 You’ll come out of Phase III in the best possible shape to throw your newly violent knuckleball. CLICK HERE to purchase The Program.